- Brad Collet won the 2015 Australian Nats at lake Coorathaba, Queensland, Australia with an Exploder & J boards. 50 boats and some top sailors like Ashby & Outteridge absent as the Moth Worlds are being held at Sorrento, Aus. Only Steve Brewin (Exploder & Explolder Z boards) aimed to compete in both events. Second place for Graeme Parker with a Dna equipped with standard C boards showing how competitive in the overall the now 'Classic' configuration can be as we witnessed at Bordeaux with the Nikitas. 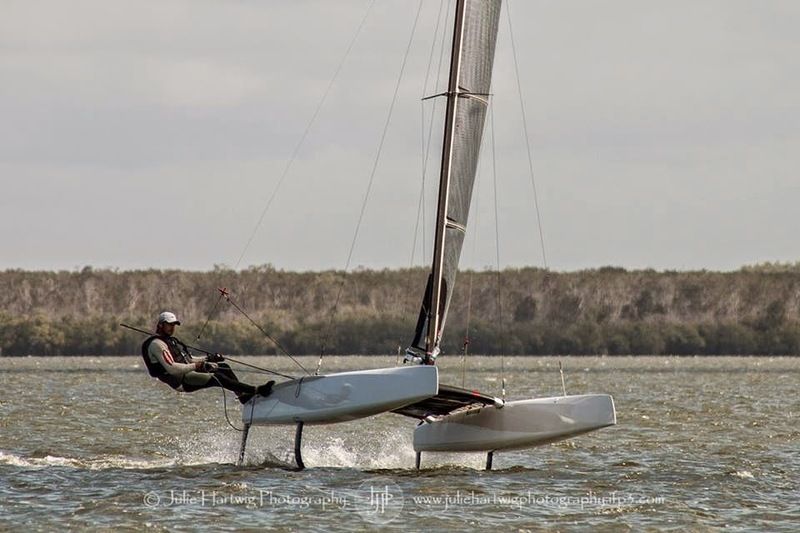 Steven Brayshaw, Dna & Z boards was 3rd and Brewin missed the chance of podium with a dnf plus an ocs on a 12 race regatta with only one discard (??). I think 12 races in the As are worth 2 discards. But Brad won 4 races on his Js against Brewin Zs. Foilers showed once again that can manage the entire wind range, but a good consistent sailor like Graeme Parker or Georg Reutter / Mathias Dietz in Europe can still give a headache to new flight conf on a light or mixed range wind regatta. That is why I think the AC Teams are losing exceptional feedback and new developments not targeting the As as last Cup, as this is the Class where new grounds can be made, there are some builders already looking to foil upwind, and I think the AC camp should be full time developing within current A Class rules, a perfect scenario to develop the winning card , as TNZ (then adopted by Oracle) did on a restricted and anti foil rule for AC34. TNZ could have won the Cup with a better light winds performance on that race that was cancelled on the time limit. Bermuda is expected to be a nice sailing venue, and San Francisco indeed was, but again all could have been defined on that a 8knots? race TNZ failed to finish.